World Hydrography Day! In honor of the IHO theme, "Hydrography - More than Charts,"
Every year, the international hydrographic community celebrates World Hydrography Day on June 21. To further the discussion, NOAA’s Office of Coast Survey invited the public to contribute articles that illustrate the theme. The articles in this collection, contributed by government and private experts, reflect the diversity of users of hydrography, with interests from marine ecology, archeology, energy and water resource management, and emergency response. John Cloud tells how hydrography helped restore oyster beds in the late 1800s ‒ and how that early work may help to restore oyster beds in North Carolina today. George Cole reports on using LiDAR hydrography to develop minimum flow standards for Florida water management districts. James Delgado and Vitad Pradith describe how hydrography helped NOAA positively identify the 1860 wreck of the U.S. Coast Survey steamer Robert J. Walker, and brought long-delayed honor to the 21 lost crew members. Paul Donaldson recounts the contributions of hydrographic operations to local economies after hurricanes. 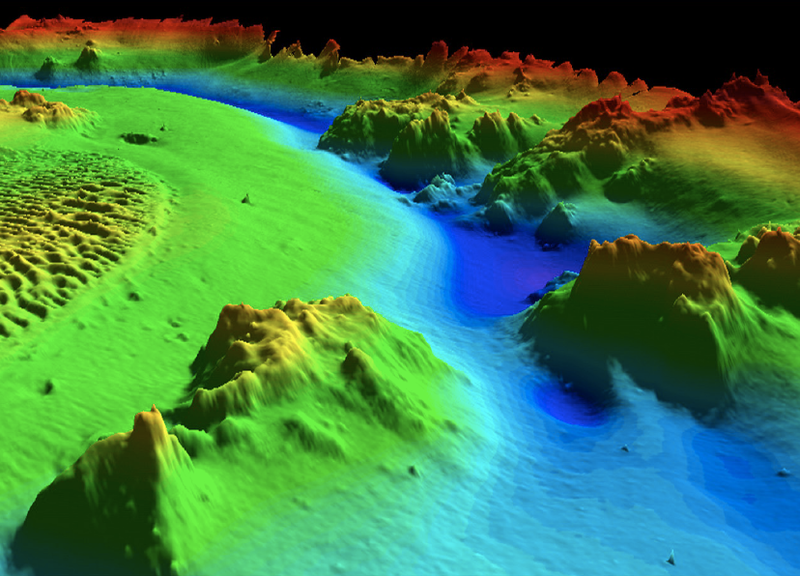 John Hersey and Paul Cooper discuss the emergence of crowdsourced bathymetry as a next-generation hydrographic tool. Joyce Miller explains how a continuing collaboration is using hydrography to conserve coral reefs in the Pacific. Alison Pettafor provides two articles: one describes how bathymetry data can determine damage to underwater pipelines, and the other shows the use of hydrography to monitor and detect problems with wind turbine seafloor foundations. Aurel Piantanida provides an overview of the use of hydrography in speeding the resumption of commerce at ports hit by hurricanes. Finally, Kevin Tomanka winds up the collection with a provocative question: are you a hydrographer? A third of all man made emissions of CO2 dissolve into our oceans forming carbonic acid. As those emissions increase scientists predict dramatic changes to sea life. In Papua New Guinea a unique phenomenon, whereby CO2 is naturally released into the sea through volcanic vents, is acting as nature's warning. It gives scientists a clue to what could happen to our oceans in decades to come. “Harvester” is a cinematic ocean documentary that explores the variety of subtle differences that make a California urchin diver’s life so unique. We aim our audience to plunge into and explore the culture of commercial urchin divers and see how they interact within their unique community, balancing work, family, and transition through an array of newly imposed environmental restrictions. The characters lead us past the traditional fisherman stereotypes, revealing the possible end of an era and creation of a new breed of environmentally conscious divers. 16477 ed8 Tagalak Island to Little Tanaga l.
16551 ed11 Unga Island to Pavlof Bay. Alaska Pen. This Scotland: Catching the Tide: A documentary about photographer Colin McPherson’s quest to capture the final days of Scotland’s salmon netting industry. In the early 1990s, photojournalist Colin McPherson embarked on a project that would take him to the heart of one of Scotland’s fast disappearing communities - the salmon net fishermen. Since then, he has spent many days - and nights - photographing them at work. The result to date is over 180 stunning colour and black & white images. Shot on the panoramic beaches of north east Scotland, this documentary film weaves together the story of the demise of the salmon netting industry with that of Colin’s creative journey. Deep water freediving exposes its practitioners to a form of narcosis, which induces several symptoms, among which a feeling of euphoria and levity that earned this phenomenon its nickname of “raptures of the deep”. The short film relates the interior journey of Guillaume Néry, the apnea world champion, during one of his deep water dives. It draws its inspiration from his physical experience and the narrative of his hallucinations.